Alissa Schmelkin and Marcy Singer opened the Gaga Center on the Upper East Side in 2012. It is New York City’s only facility dedicated to gaga. Alissa and Marcy are both originally from Long Island and met when they were kids at sleep away camp (Camp Blue Ridge in Equinunk, Pennsylvania). Though they played lots of sports at camp, they had never heard of gaga until their own kids discovered it at their camps – Coleman Country Day Camp and Hampton Country Day Camp. 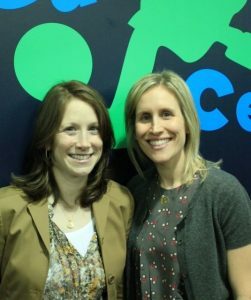 Before they started The Gaga Center, Alissa and Marcy were both stay-at-home moms, and before that, Alissa was a business journalist and Marcy was in the commercial real estate business and then taught elementary school. What brought you to New York City and what was youth sports like where you grew up? We both moved to New York City after college for school and job opportunities and never left. Youth sports are more intense today than when we were growing up. Kids become specialized at earlier ages now. Kids love gaga because it is one of the only sports they play where they are able to move freely without getting critiqued. If you sit at most kid sports events, you can hear a constant hum of parents and coaches correcting kids on their movement. At gaga, kids are free to move around and hit the ball any which way they want, and that’s part of why they love it. Tell us about your family. How many kids? What sports do they like to play? Marcy: I have two boys, ages 9 and 6. My older son loves tennis, basketball, soccer, skiing and roller hockey. My younger son loves basketball, soccer and tennis. And they of course both love gaga! Alissa: I have three kids, two boys, 11 and 7, and a girl who is 2. My oldest is all basketball all the time, except when he is playing gaga! My 7 year-old loves basketball, baseball, tennis and soccer, and, of course, gaga. And my little one wants to try anything her big brothers are playing! What made you open The Gaga Center? What about gaga makes it attractive to kids? We opened The Gaga Center because at the time, we had four boys between us and they had no place to play gaga, a game of which they all couldn’t get enough. Each of them played at camp, but there was no place for them to play in Manhattan. Like we mentioned above, gaga is a game where kids can feel free to move in any way they want. The games move fast (each lasts about 5 minutes), and you don’t have to be the best athlete in the pit to win. In fact, the game has an element of luck to it that keeps things interesting, and allows anyone to be the winner. What were the challenges of opening The Gaga Center? Like any new business, opening The Gaga Center was extremely time consuming. For two people whose time was almost all already taken up with pick-ups, drop-offs, nighttime feedings and other household responsibilities, we had no choice but to work efficiently and be patient as we were getting started. Any plans to open more facilities? We are about to announce the opening of our second center. More news on that shortly! What in your background prepared you to open a youth sports facility? We are the profile of our customers. So we are constantly going back to the question: How would we as the customer want it? That philosophy has always helped guide us. What’s it like to raise active kids in NYC? Having kids is certainly a juggling act. Divide and conquer seems to be the only way to go! How do you juggle all the different activities of your kids? We often ask ourselves the same question! Not sure how, but we do it. How do kids inspire you? Despite all the iPads and video games kids gravitate toward, when given the chance to just play a simple, physical game, like gaga, they are so happy. They actually don’t need all the bells and whistles to truly enjoy themselves. If you have one, what is your most treasured sports possession? Marcy: When my older son was born, my husband brought a baby LeBron James Cleveland jersey to the hospital and we pinned it to his hospital bassinet. That little jersey is very special to me. Alissa: We have the line up card from my son’s first game at Yankee Stadium. Derek Jeter and Mariano Rivera are among the legendary players listed on the card. Knicks or Nets? Knicks and Nets, in that order! Mets or Yankees? Yankees all the way! Marcy: Madison Square Garden. That is where both my boys attended their first basketball game. Alissa: Yankee Stadium for all the family memories. Best sports memory (involving you as a player or a spectator)? Marcy: Not sure I have a best, but my favorites are definitely as a spectator. There is nothing better than watching my kids play their favorite sports competitively. Alissa: Watching my son’s team win the 5th Grade Basketball Championships at House of Sports this past winter. The score kept flipping until the last few seconds of the game! Go Titans!